Confessions of an ADD English Teacher: The Blog Workshop was awesome! This past weekend, I attended my very first blogging conference. I can't even begin to tell you how glad I am it was an online conference! I can't imagine trying to get around a hotel or conference center on crutches. Aside from the physical issues I had that would have made an in person conference challenging, there are some huge benefits for attending an online conference. The first one, I have to say is the savings. 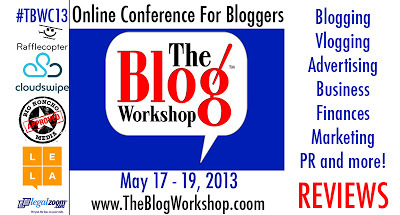 At $175, The Blog Workshop was less than you'd pay for hotel alone at a big conference. Secondly, the time. No time away from family or work. With the sessions held in the evenings, I was all to get my To Do list done and attend without impacting the family. Third, you happen to miss a session or information, its recorded so you can go back to it. I always love the tweets from blogging conferences. Simple, 140 characters that get right to the heart of whatever session is being discussed. This conference was no different, and it was fun to be one of the ones actually tweeting! Be true to your own voice. Don't try to be other bloggers. The best bloggers (and writers) are the ones that are consistent and recognizable. Be yourself! There is a reason that your readers follow you. I want my readers to come back because they like what I have to say. As a person who was trained as a print journalist, it's hard for me to get in to the friendly and casual blogging style of writing. I just need to embrace that my writing is probably going to sound more newsy than other blogs. I tend to write in paragraphs; I use semicolons properly. I just need to go with it. I am looking forward to going over the sessions on SEO and marketing again. During those sessions my eyes glazed over just like they did when I took my advertising and marketing classes in college. Some things never change. Thank you for the lovely review! We're so happy to hear all your positive feedback. I'm glad everyone had such a good time, I enjoyed myself too :) Recordings are available and we have a surprise going out for our #TBWC13 attendees soon. We're looking forward to connecting with you more and continuing our journey in blogger education.